It usually takes at least 90 days before most search engines have indexed a new website, and a targeted pay-per-click campaign can give your website a huge boost in getting noticed. If you want to get your website on the first page of the major search engines (Google, Yahoo, Bing etc. ), setting a campaign budget is vital to your Internet success. 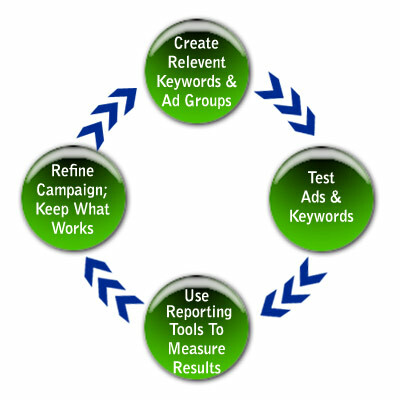 The search engine experts at Website Solutions will select the appropriate keywords and customize a campaign to maximize your budget. It takes time to achieve top rankings in the search engines. As more businesses implement the Internet as their strongest marketing tool it has become difficult for a new website to achieve first page placement. While strong organic placement is desired a targeted search engine marketing (SEM) campaign can give your website the boost it needs. Our search engine optimization (SEO) department works very closely with the search engine marketing department to ensure you are receiving the highest placement results while only using the highest white hat SEO and SEM methods.